Beautiful bright pink Peacock Badge. 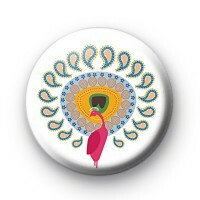 This majestic bird badge would be a pretty addition to any coat or bag you have. All our 1-inch badges are handmade and we have a huge selection of animal badges in the shop.